From 2016-2017, Wellington-Dufferin-Guelph Public Health (WDGPH) completed a process and outcome evaluation of the in-person prenatal program. Ten recommendations emerged from the evaluation. To date, six of the recommendations have been fully implemented, two are in progress and the remaining two will be completed by the end of 2018. Program changes implemented January 1, 2018 have already demonstrated improved value for money. The revised program and schedule has reduced instructional hours for the program by up to 74% without negatively impacting registration numbers and participant learning. Program changes implemented January 1, 2018 have resulted in zero class cancellations to date in 2018. This has eliminated the administrative burden associated with class cancellations. It is recognized that the in-person prenatal program does not meet the needs of all priority populations in the Wellington-Dufferin-Guelph (WDG) community including youth under the age 24, low-income households, single individuals, individuals with less than high school education and unemployed individuals. WDGPH is developing new strategies to better reach these individuals prior to and during pregnancy as they are at greater risk of adverse prenatal and childbirth outcomes. The Ontario Public Health Standards (2018), provides requirements for programs, services and accountability for public health units in Ontario. Within the Healthy Growth and Development Standard, there is a requirement for boards of health to develop and implement a program of public health interventions using a comprehensive health promotion approach to support healthy growth and development.1 Boards of health are required to consider the topic areas of healthy pregnancies, breastfeeding, growth and development, mental health promotion, preparation for parenting and positive parenting based on an assessment of local needs. An evaluation of the WDGPH in-person prenatal program was undertaken to better understand the local need for this program in the WDG community. Studies show that prenatal education increases knowledge, the likelihood of being in active labour when arriving at the hospital, and rates of breastfeeding initiation and continuation.2,3 Prenatal education also improves maternal mental health and mental readiness for childbirth, decreases use of epidurals, and increases satisfaction about couple and parent-infant relationships after birth.3 As a result, prenatal education has the potential to positively impact individuals, families and society. Capitalizing on this opportunity requires WDGPH to determine the specific role that an in-person prenatal program has in the larger context of community programs and services in addition to a population health approach to improving healthy pregnancies. The in-person prenatal program at WDGPH is facilitated by a registered nurse (RN). Each group session incorporates a variety of information sharing methods, including videos, activities and group discussions. WDGPH continuously monitors registration numbers to assess if the changing landscape for information sharing including websites, social media and apps has an influence on this program. How does the WDGPH prenatal program currently operate? What impact is the prenatal program having on participants? Is there still a need for the prenatal program in the community? How can the prenatal program be improved? How do other central west and south west public health unit prenatal programs operate? To answer these questions, WDGPH developed a comprehensive evaluation plan and collected both quantitative and qualitative data from seven different sources. Evaluation data collection methods are summarized in Table 1. An evaluation report was prepared that describes in detail the findings from the evaluation.4 Overall, the evaluation concluded that there is still a need for the program in the community. Ten recommendations were developed to improve the program. A summary of these recommendations and actions taken are summarized in Table 2. Curriculum completely revised. Instructional time for program reduced from 12 hours to 6 hours. New program emphasizes a hybrid approach to learning by pairing an online program with the in-person education. New program launched January 1, 2018. Increase transparency of payment options and ease of registrations for clients experiencing financial hardship Complete As a result of partnerships with EarlyON, the in-person prenatal program is available at no cost to all program participants as of June 28, 2018. Guelph program moved to EarlyON at Stone Road Mall as of June 2018. No need to relocate Fergus program at this time. Implement strategies that will increase local healthcare provider awareness, support, promotion and client referral to prenatal education. Complete New prenatal referral form developed and promoted with healthcare providers including physicians, obstetricians, midwives, nurse practitioners and nurses throughout WDG. First formative evaluation for the newly launched curriculum took place from January – June 2018. WDGPH is committed to an ongoing and iterative cycle for program evaluation. Develop a new model for prenatal education delivery outside of Guelph, Orangeville and Fergus. In progress Will be developed by the end of 2018. Develop a new model to deliver prenatal education to priority populations including youth (under 24 years) and low income households. In progress Will be developed by the end of 2018. Support community partners (e.g. community centres, libraries, labs, doulas, etc.) to promote the prenatal program with their clients. In progress Scheduled to begin Q4 2018. Assess local interest in the establishment of a prenatal service provider’s network. In progress Scheduled to begin Q4 2018. As a result of the prenatal evaluation, WDGPH has been able to implement significant changes to the in-person prenatal program. One of the changes that took effect January 1, 2018, has been the movement to a hybrid model that emphasizes participation in both an online and in-person program. This change has allowed the in-person program to be reduced from 12 hours of instructional time to 6 hours. The Saturday class offering was also discontinued as of January 1, 2018 with classes now only running on weekday evenings. These changes to both the instructional time and the schedule have reduced instructional hours for the program by up to 74% from a high of 672 hours in 2015 to 174 hours in 2018. 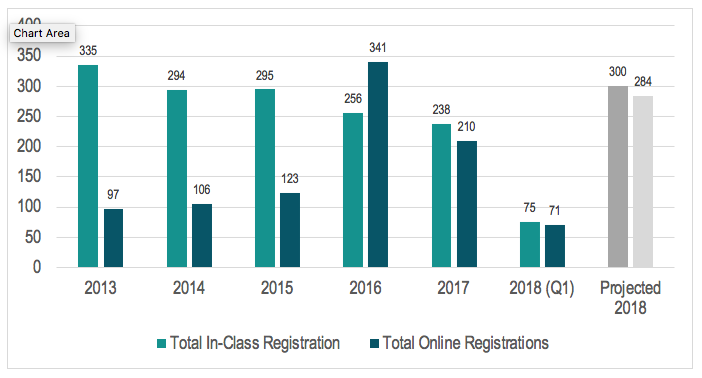 The value in these changes are that even with a significant reduction in instructional time and class offerings, it is projected that WDGPH will reach slightly more individuals through the in-person program in 2018 compared to previous years (see Figure 1). In addition, these changes have resulted in a streamlined schedule that has seen zero cancellations to date in 2018, where previous years have seen up to 21 series cancelled (see Table 3). Cancellations previously had a large administrative burden which involved contacting participants, issuing refunds and re-scheduling clients. With zero class cancellations projected in 2018, this will result in time savings for the Family Health program assistant. In addition to financial savings achieved through the in-person prenatal evaluation, the formative evaluation has demonstrated that program participants continue to learn new information through the program. For example, 93 to 95% of participants agreed that they learned new strategies to help them prepare for labour and birth, breastfeeding and early parenting through the revised curriculum. The in-person prenatal evaluation demonstrates the importance of evaluation as part of an ongoing and iterative cycle of program development and improvement.1 WDGPH continues to be adaptive to the changing needs of the community from an individual to a systematic level when planning and implementing interventions with the aim of contributing to healthy pregnancies. The in-person prenatal evaluation led to significant program changes that have improved the value for money of the program without negatively impacting registration numbers and client preparedness for labour and birth, breastfeeding and early parenting. WDGPH is currently planning new strategies to better meet the needs of pregnant priority populations throughout WDG. Goal: To achieve optimal preconception, pregnancy, newborn, child, youth, parental, and family health. To reduce these health inequities, WDGPH is currently developing a new model to deliver prenatal education to priority populations including youth (under 24 years) and low income households. This model will be developed by the end of Q4 2018 (See Table 2). Wellington-Dufferin-Guelph Public Health. 2018. In-Person Prenatal Evaluation Findings. Guelph, Ontario.